I actually don’t care the least little bit about pictures of anything but nature, but to provide some light relief, here are a couple. So here is my house. As you can see, I’ve beat it up pretty badly. In the lower right corner is my co-pilot, Mason, and barely visible behind her is the cat, whom I can’t train to do a blessed thing but jump in my lap when I’m trying to knit or blog or eat or, really, anything that would cause maximum inconvenience. And here is my trike. I ride this all sorts of places that people don’t generally ride trikes, or, for that matter, anything without a motor. I know people go mountain biking on these trails because I see the occasional tire track. The only actual human beings I see, though, are the ones riding OHVs, ATVs or motorcycles. They sometimes stop to ask me if I’m all right (which is very nice of them) because they can’t imagine what I might be doing out in the desert (or forest) miles from the nearest outpost of civilization. It seems inconceivable that anyone would choose to ride 15 or 20 miles on a trike. Although people do it all the time. Maybe it is because I am old and should be sitting in front of a homey fire eating bon-bons or knitting tea-cozies or something. To prove how different the deserts of the southwest can be, I have provided some comparison photos. 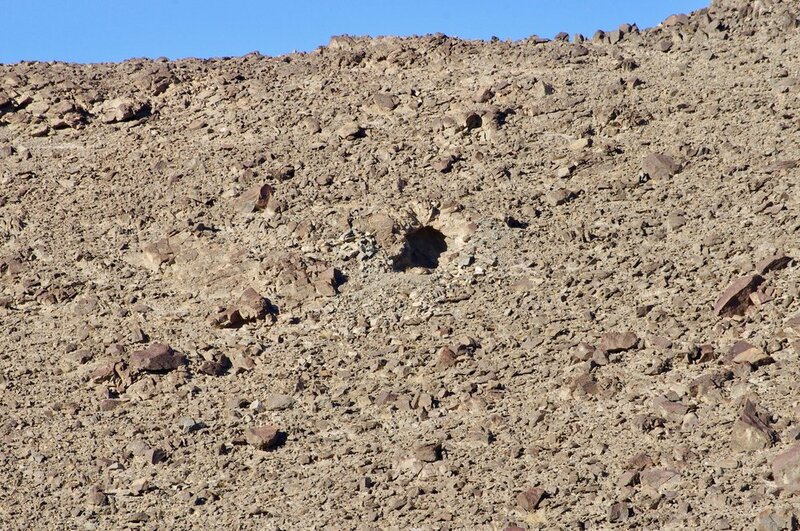 Let’s start with the desert outside Yuma. The closest thing we get to greenery is creosote bushes and the odd Palo Verde. No cacti here. To ensure you don’t miss the cacti, all the bushes and trees have dreadful thorns. The only thing missing is the remarkable ability of the cacti to leap out and stick themselves to you with barbed thorns that hurt coming out more than they do going in. 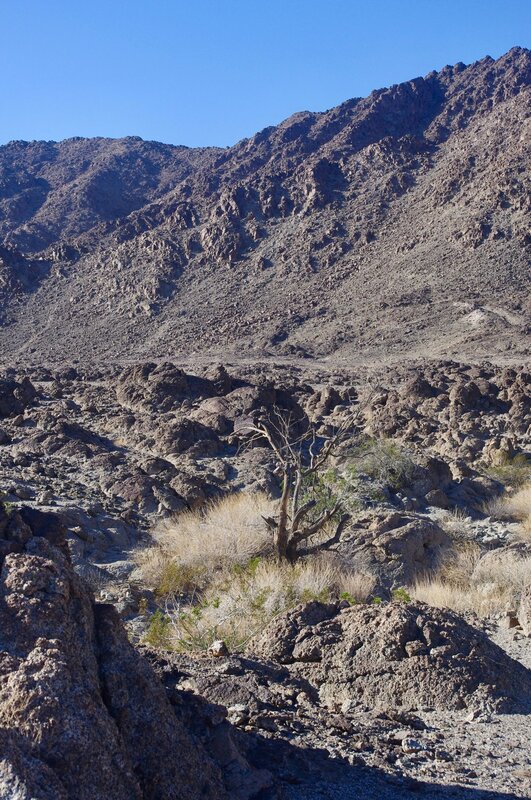 Actually, the desert around Death Valley looks a little like this, except it has even less foliage, prettier rocks, and a whole lot of salt. Just a few miles east of Yuma we have the KofA National Wildlife Refuge. I really love KofA (that stands for King of Arizona, the name of a now-defunct mine for, I believe, copper, in the refuge). Unfortunately, it presents two difficulties. First, virtually none of the roads are appropriate for RV travel. Naturally, that doesn't stop us from traveling into the refuge to camp. It simply means that it takes 45 minutes to travel 5 miles over sharp gravel, washboard surfaces and the occasional giant pothole. Plus you are risking the health of your tires. After you leave the camping area, the going gets much worse. I can’t even ride most of it on my trike, although I gave it a valiant effort. Second, there are a gracious plenty of cacti, and my co-pilot doesn’t seem to have the sense to avoid them, so she is constantly dragging bits o’ cactus into the house which I must try to pull off her while she strenuously resists. Here we have the Buenos Aires National Wildlife Refuge south of Tucson. There are actually a few different types of landscape here, but this is where we camped, and I rode through 18 miles of pretty much the same thing looking for Pronghorn Antelope. Of which I saw, regrettably, none. The only wildlife I succeeded in viewing were some deer, which are small in comparison to the ones that wander across my property in northern Idaho in giant herds. Apparently, though, there is great birding here, and sightings of the antelope are not uncommon. 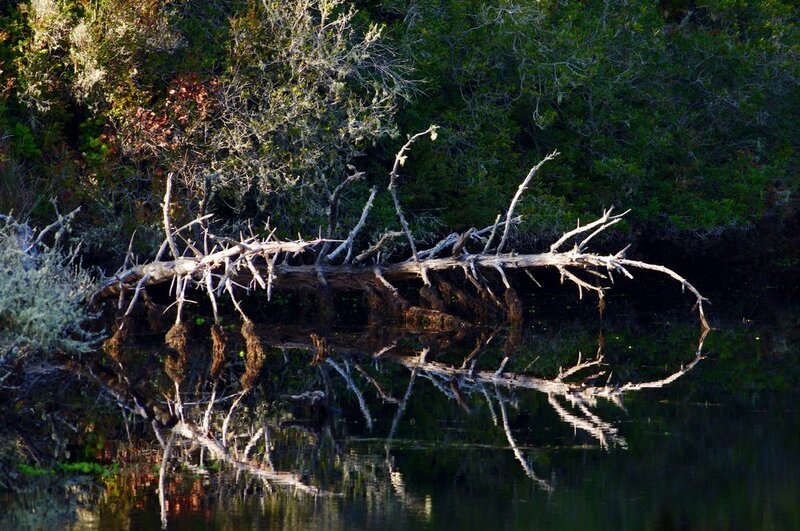 Here is a little gem buried within the BA NWR. It is a riparian area I stumbled across while riding the “paved” road through the refuge. I say “paved” because, though it does actually have black stuff on it, it is worse than some gravel roads I’ve been on. The whole thing is nothing but patch on top of patch, infrequently interspersed with a bit if loose asphalt gravel and some large potholes. Apparently, one can take this horrendous road all the way to I-17. If one wanted to for some strange reason. Obviously, this is not a desert. But is right in the middle of a desert-like area. Here we have the Ironwood National Monument northwest of Tucson. The saguaro (which these cacti are) aren’t really an issue because they keep to themselves rather than leaping on unsuspecting tourists. Here is part of Saguaro National Park (west unit), also west and slightly north of Tucson. Plenty of saguaro here plus the ubiquitous Prickly Pear. Although this photo doesn’t show any, there are also Barrel Cactus, Cholla and Hedgehog Cactus. More on that in a future installment. Here’s something else I found near the Chocolate Mountains. If this looks like a picture of the ground, that is because it IS a picture of the ground. There are two large, fenced areas with signs outside explaining that they are rare geoglyphs. I spent a lot of time walking around the fences trying to tell the difference between the geoglyphs and normal desert landscape, and was never quite sure I had done it. I thoughtfully took many pictures in hopes that the glyphs would be more obvious in the photos than in real life. Alas. They aren't. However, the BLM assures all of us that the glyphs are there. I finally decided that these straight lines must be part of a geoglyph. I can’t make out what the glyph is depicting, but this looks too straight to be natural. Here are some zig-zag lines that I also concluded must be part of a glyph. And here is the sign proving that there are, in fact, geoglyphs here. I did a lot of trike riding around Yuma, and ended up in a lot of cool places. I would take off on a BLM road and ride it all the way into the mountains where it either ended or got so steep and so loose that I couldn’t get traction any more. One of the first things I found was these old basins that were used for sluice mining. How they got enough water to sluice mine is a mystery to me, as there isn’t a whole lot of desert as barren as the desert around the Chocolate Mountains. Nevertheless, there were basins at the top of a cliff, and below the cliff was a wasteland of sand and gravel typical of this type of mining, so somehow or other they found the water. Here is the lush, green desert around the Chocolate Mountains. Well, it is as lush as it gets, anyway. Vertical mine shaft that has NOT been fenced off to stave off terrible accidents involving holes and vehicles. Vagabond Tourist’s Helpful Advice: DO NOT RIDE YOUR OHV AROUND HERE IN THE DARK!!!!!!!!!!!!!!!! I tried and tried to find a shaft I could see into so I could see if the bottom was visible, but no such luck. The gravel around these holes is so unstable that I didn’t dare get close enough to see. Perhaps another, more intrepid person would have done it anyway, but I’ll have to leave that up to someone else. Very seldom do you find any of the old structures around these mine shafts. Here is a rare exception. I was hoping to determine whether miners actually went down into the mine via these vertical shafts or whether they were just for air or light or something, but I could not tell from the wreckage. Much less often, you find a horizontal mine entrance like this one. I think I found three of them all told, although I know there is another one somewhere around American Girl because I saw a photo of it on-line. On the roads to these mine shafts, the BLM has placed signs advising us that abandoned mine shafts are dangerous. That is the reason I can tell you, with confidence, that you should be very careful around them. Here is the second of the three horizontal mine shafts I encountered. It may appear that this one was unfenced, but that is inaccurate. I am shooting through the fence. Not that I would have gone into the mine if there were no fence… Well, okay, I WOULD have gone into the mine if it were not fenced, but not very far in because I am only a little bit stupid rather than very stupid. This is the view from inside the mine shaft, or at least as far as I could get inside the mine shaft. At the end of another road, I found this old cabin. Since there was the usual warning sign on the road approaching the cabin, I knew there was a mine shaft somewhere in the vicinity. I found the old mine shaft way above the cabin. I actually clambered up here to see how far I could look in. Clambering up, and particularly down, is extremely treacherous if you are me and have CMT. It is steep enough that I was worried about teetering down the hill in an avalanche of rock, or breaking my leg or something. Unfortunately, the shaft had been blocked by a cave-in (deliberate?) not far from the entrance. Ah, here is the desert near Yuma in springtime. It is not entirely without color. 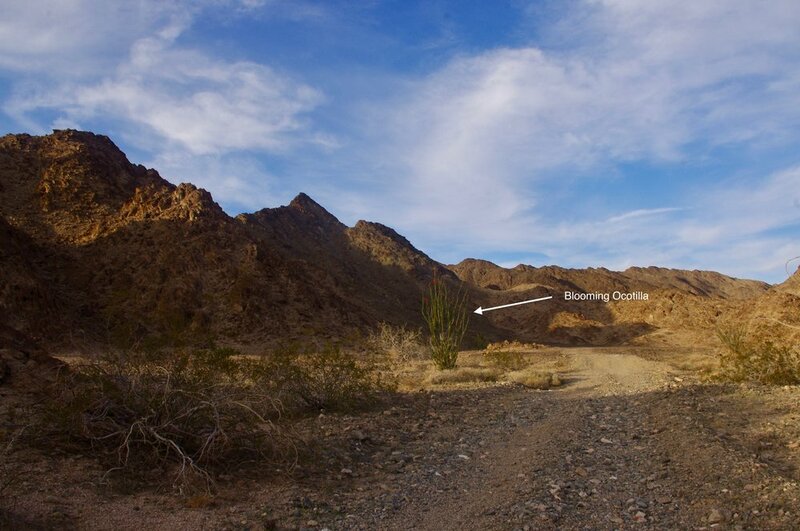 The track you see going around the Ocotillo is the road I am riding up. I believe this road ends up in the area around where I found the vertical mine shaft with all the wreckage at the top. Very shortly after I took the pictures at Lagoon (like the next day), it started raining on the Oregon coast. And raining. And raining. And then it started snowing in the mountains, which I had to get across. And then there were storms coming everywhere…so I fled south as fast as I could go. I didn’t miss a blizzard in Nevada, though…I had the pleasure of driving 25 mph through a white-out in a motorhome with no snow tires. That was fun. Also, my entire propane system stopped working. That meant no heat, no refrigerator, and no hot water. In freezing weather. In addition, I couldn’t make any arrangements for propane repairs because 1) I had no cell service, and 2) there was a winter storm warning for the next day. So I got myself an ice chest and a little electric heater and squatted in the Walmart parking lot in Fallon, NV for a few hours, then continued south. I made it to Yuma in record time and camped on BLM land west of town. I’ve been doing this for a couple of years now, but this year I discovered a bunch of interesting things to see that I had no idea were there. 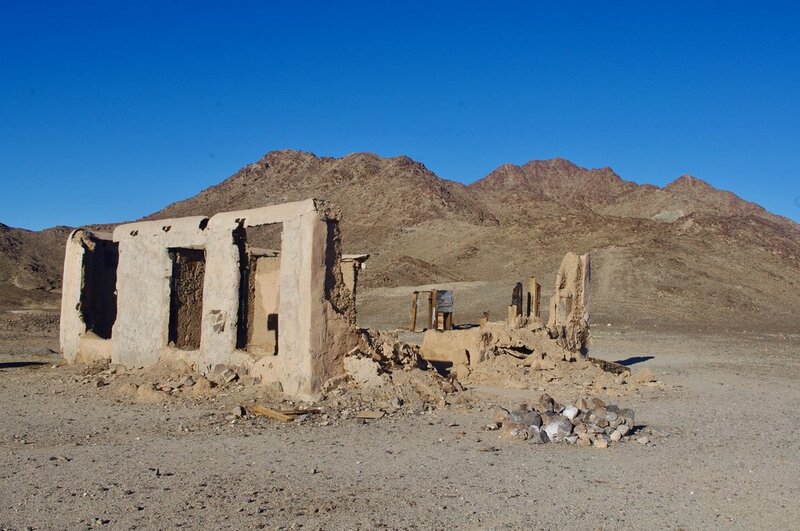 It seems that the Chocolate Mountains have a long history of gold mining, starting early in the 20th century and continuing through several incarnations after that. The American Girl pit mine, which closed in the 1980’s, is apparently the last of these. Here is the American Girl mine pit. And there’s plenty more of it that you can’t see here. All pit mines look pretty much the same…enormous, desolate pits. The American Girl mine is typical in this regard. And here is a bunch of equipment sitting on the edge of the pit. I have no idea what all this stuff is for. 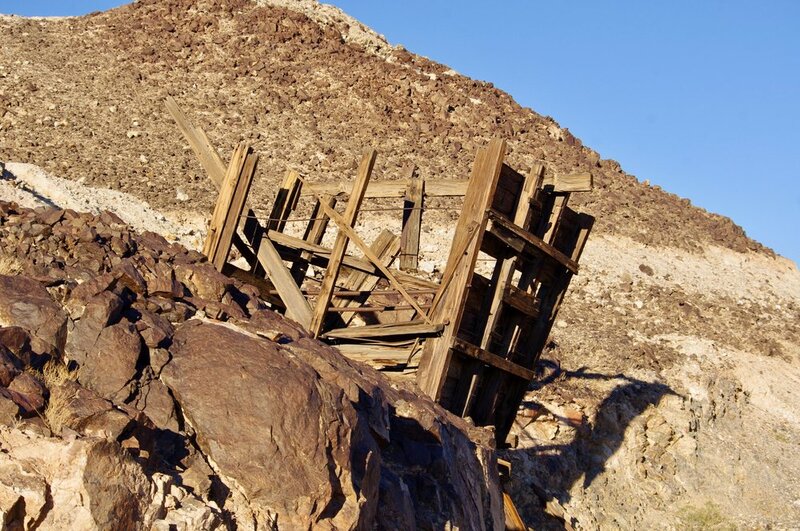 Also at the American Girl mine is this battered wooden structure. It is perched on a hill of what appears to be mining leftovers…gravel and sand and rocks. Here is the front of the structure. The bit of ramp sticking out below the main structure seems to be part of a sluice, although it’s hard to be sure about that. Perhaps this is American Girl Pit Minus One (AGP-1 — previous incarnation). My next camping spot was at Lagoon, south of Florence. It’s pretty hard to beat Tillicum Beach, and in fact, Lagoon didn’t do so. It was pretty in its own way, though. If you walk across the dunes to the beach, you find a bunch of flatness where many people in OHV’s dash around roaring up and down the dunes. At this time, though, they were not dashing (or roaring) in this particular spot because it was nesting season for the Snowy Plovers and so, temporarily, off limits. This is what the lagoon looks like, all stagnant and peaceful. The lagoon is so still that everything appears twice. On my way from Tillicum Beach to Lagoon, I stopped at a number of scenic places, state parks, etc. The entire Oregon coast is one giant scenic view. These photos were taken near (and at) the Hecate lighthouse. It is hard to resist taking zillions of pictures of the scenic Oregon coast. So I made nom effort to resist, and here is yet another picture of waves and rocks. And this shows the many lenses of the lamp inside. So at Smelt Sands, I took a bunch of photos of the waves crashing into the rocks. I chose two that I like, but was not able to choose which of the two I like best, so I thought we would have a vote. Generally we here at Vagabond Tourist don’t encourage this sort of thing because, well, you can see how easily it could get out of control with people actually expressing their opinions and stuff. We can’t have that! In this case, though, I couldn’t figure out any other way to break the tie. Please indicate your vote in the comments. There never are any comments, so I suppose the tie will remain unbroken, but you never know. A single vote could decide the entire race! Your vote will never again count for as much as it does here! A few miles down Highway 101 (perfect distance by trike), there is a tiny unit of the Oregon State Park system called Smelt Sands. It sounds rather foul, doesn’t it? But it is not foul. On the contrary, it is gorgeous. Now this is a place worth camping in! 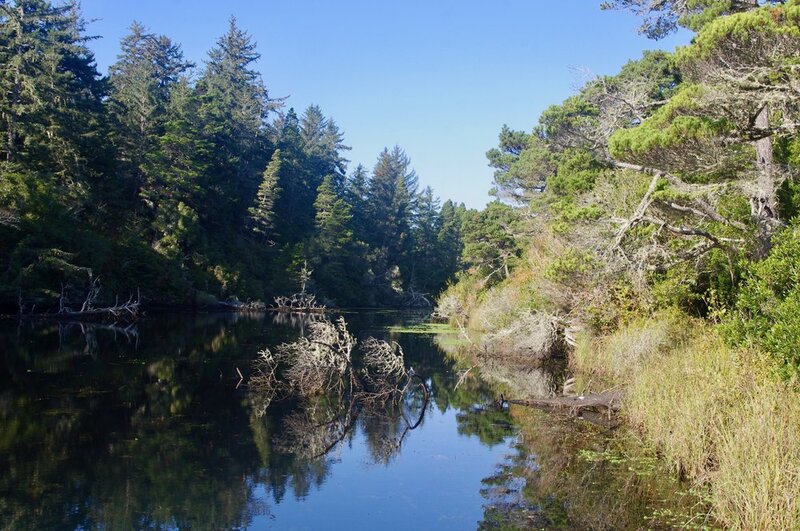 It is a National Forest campground right on the bluff overlooking the ocean. You can hear the surf all day and night, and look out your window and see the beach. We went walking on the beach and looked up at the bluff on which the campground is located. There were these trees sculpted by the wind. 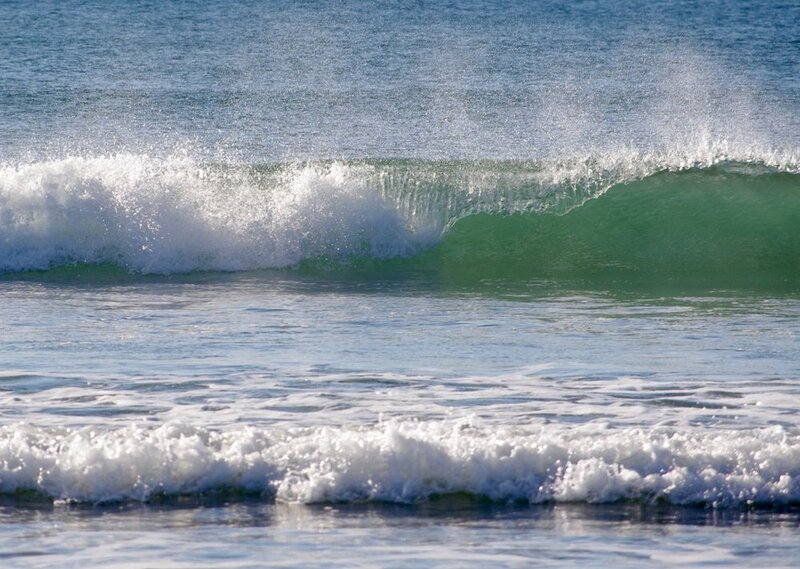 And what trip to the beach would be complete without a wave picture? Of course I simply had to take pictures of waves on the beach…it is actually quite hard to take interesting pictures of waves. They all basically look the same: a great expanse of beach ending in a great expanse of ocean with lines of waves coming in. You kinda have to have people waving or falling over into the water or something, and my beach buddy (co-pilot Mason) would not go near the water. Newport actually is a town. We generally don’t do towns here at Vagabond Tourist because the Vagabond Tourist doesn’t really like towns. However, I rode my trike onto the outskirts of Newport and found this nice bridge. I realize this is a bit abstract. I really liked the ‘wave’ patterns on the beach. Here we are just south of Newport, and the Snowy Plovers are apparently a pretty big deal. These two Snowy Plovers were just hanging out near each other, and may even be a pair sitting on a nest, although this isn’t supposed to be nesting season. 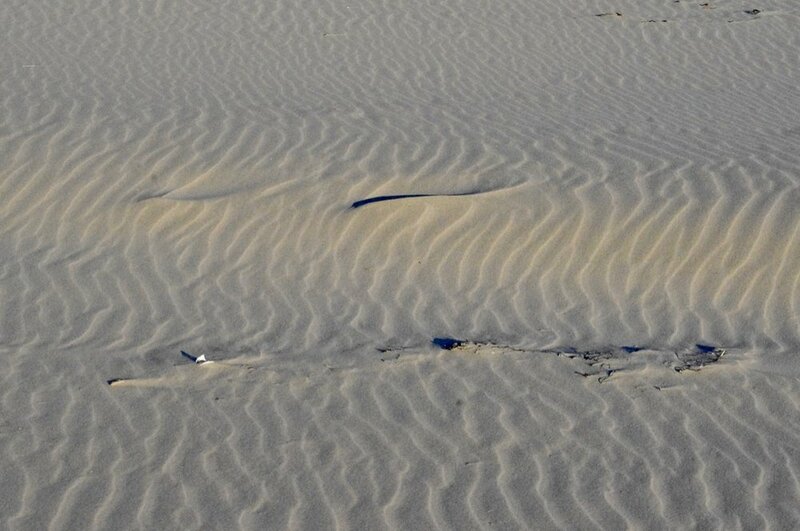 “Nest”, for a Snowy Plover, is a shallow hollow scratched out of the sand. Here is a bunch of Snowy Plovers making out with their reflections in the water. The Snowy Plover is renowned for its high self-esteem. And here is a bunch of birds doing what birds do best…running away from people. Mt. Jefferson? Washington? something else? This is what the east side of the Cascades looks like in Oregon (and Washington, for that matter). There is an informational sign at the spot where I took this photo, but for some strange reason, they didn’t indicate this particular mountain on it, since they were all taken up with the three sisters. I know what you’re thinking. You’re thinking that Imogen messed up the ISO setting and that’s why the sky is grainy…but NO!! THE SKY REALLY LOOKED LIKE THAT!!!!! Ok, I’m lying. The sky did not look like that, and when I reached the coast, I finally sat down and figured out how I had changed the ISO setting to 6400 and messed up all my pictures. It turns out that when one wildly mashes buttons without looking at them whilst one is fumbling with the camera, it is very easy to change the ISO setting. Which was great, when I finally wanted to change it back. So there we were, bombing down the highway (US 20) in eastern Oregon, and all of a sudden, I saw this Light of Epiphany through the windshield. Naturally, I did what any self-respecting tourist would do…I fished out my camera with one hand, pointed it in the general direction of the phenomenon, and started clicking away. After wading through a few shots of dead bugs and other windshield debris, I got a more-or-less useable picture. Here it is. I am trying to drum up sympathy for myself by showing you what kind of hell-hole I live in during the three or four months I am not living on the road. Yes, I am being sarcastic. We are on my driveway looking toward the draw that runs through the property. The draw is where all the birches and aspens are; the remainder of the property is various types of conifers. In the Fall, aspens turn this ethereal gold color that is utterly gorgeous. This year hasn’t been one of the best for Fall color, but even so, it’s still pretty wonderful. These trees are on the edge of the field that borders the draw. 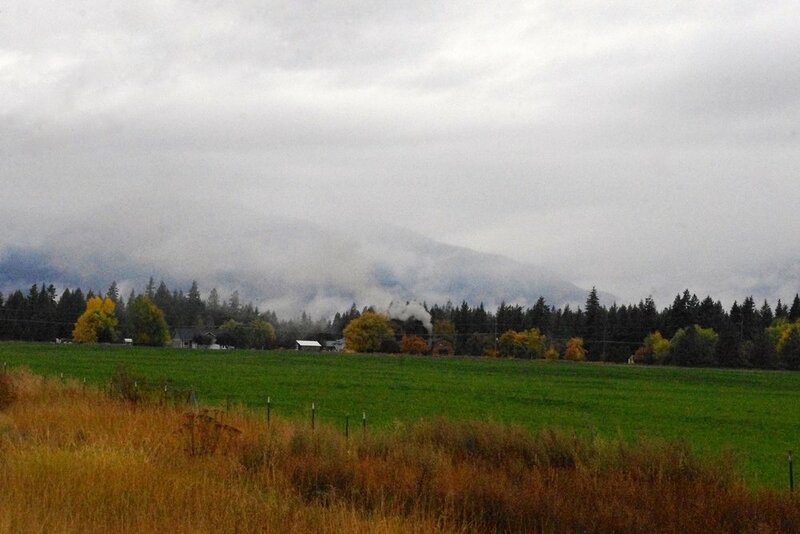 Here is fog creeping over the mountains looking northwest from the highway to town. In the Fall, the mountains are dotted with what appear to be dying conifers…but they are actually Tamaracks (aka Western Larch), a deciduous conifer. This is a crappy shot of a tamarack across the street from the foot of my driveway. Where on earth are we?? I cannot, for the life of me, remember where this is. I think it’s in Utah somewhere. There is something geologically interesting about this pass which I also cannot remember. grr. The same lingering error that obliterated Monarch pass obliterated most of my photos of this pass, too. And even after it was corrected, there remained this horrible ISO setting that made the sky all grainy and disgusting. Seriously, Imogen. Get a grip. I call this photo the castle on a hill. It is typical of many southwestern desert-scapes, but it is very hard to resist photographing them because they are so beautiful. Leaving Rio Grande del Norte, we drove back over Monarch pass, which is even higher than Wolf Creek pass. Of course I recorded it for posterity, but due to the same operator failure which destroyed my best photos of City of Rocks, I destroyed all my photos of Monarch pass, also. Therefore, I have posted this lovely wild iris as we wave goodbye to Colorado for this season. Finally, we reached our destination: Rio Grande del Norte National Monument. 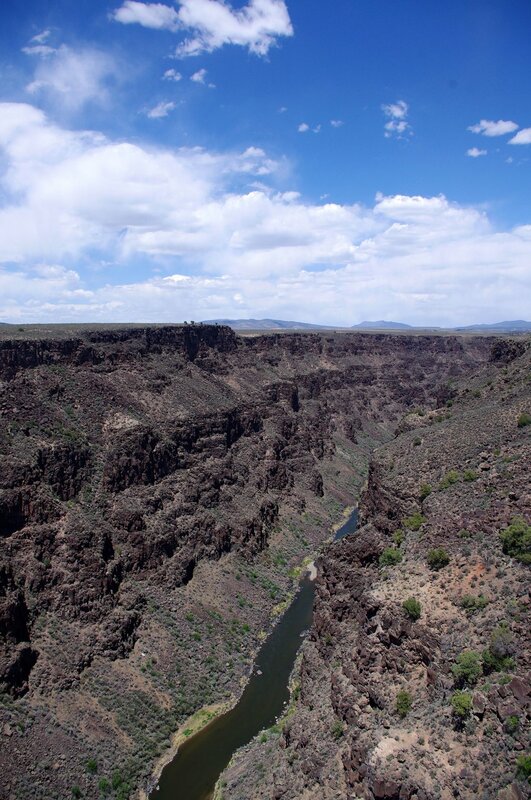 I had been wanting to see Rio Grande del Norte NM for two years, and now I wonder why. It’s a fairly large National Monument, but there was only one place I could find where the Rio Grande was visible — waaaaaay down in the southern tip near Taos. And (drumroll) here it is!! The Rio Grande! I can tell you’re all as impressed as I was by this awesome sight. 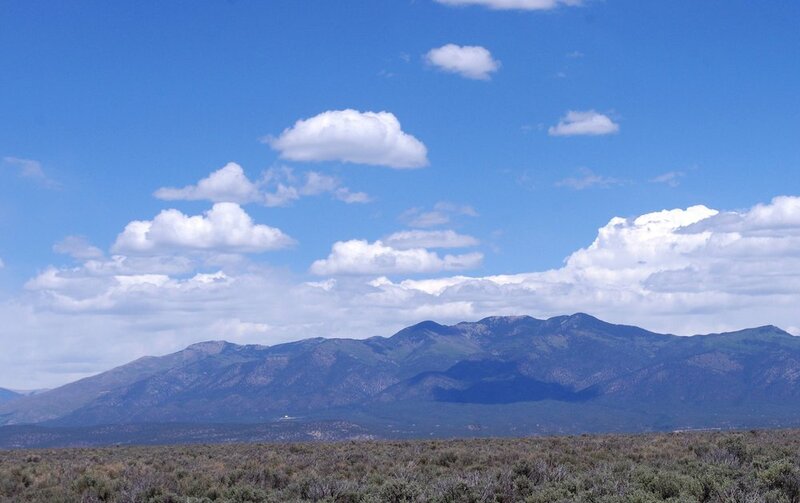 The rest of Rio Grande del Norte NM looked a lot like this…minus the cloud shadows.